Caption slip reads: "Photographer: Lapp. Date: 1957-07-16. Reporter: Hartt. Assignment: 40th division 40th birthday. 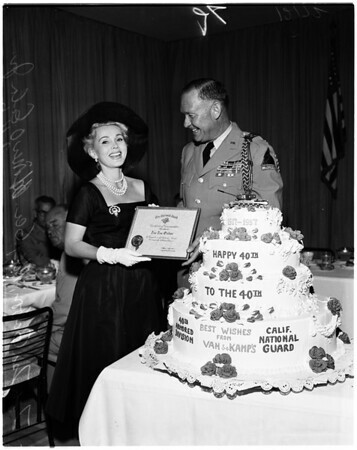 7,8-43,45,25: Zsa Zsa Gabor & Major General Homer O. Eaton Jr., commanding general 40th Armored (National Guard) Division at 40th's 40th birthday party".